Well, it's happened: CNN has pushed out Lou Dobbs. CNN has been under pressure by "immigration" and Latino groups to get rid of Dobbs. 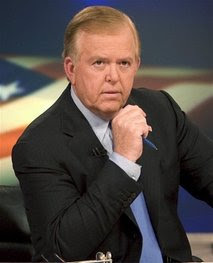 I'll tell you; I have been a loyal fan of Lou Dobbs for years. I do not think he is a racist. Nor do I think he is against immigration. What he does speak out against is "illegal" immigration. I put the word "illegal" in parentheses because some people do not like the word, stating that no human being is illegal. That is not the purpose of my post. Why do people believe that America does not have the right to sovereign borders?! Anyone reading this who has been to Hajj can tell you that the Saudis keep your passport until you leave their country. And at that, you need an exit visa. Other countries in the Middle East also require you to surrender your passport while you are visiting. And some of them also have exit visa requirements. So, why not America? America has a very generous immigration system, although there are some bureacratic problems with it that need to be fixed. You may say that America does not belong to the people who currently live here. That many who enter the US "illegally" are just coming to their own country anyhow. That we, who currently inhabit America, are the illegal people. If you believe that, you should be prepared to pack up and move to the country where your ancestors came from. Give America back to the indigenous peoples. But I digress from Lou Dobbs. Lou Dobbs. Racist? Anti-Latino? Few people know that his wife is a Latina! Sometimes when Caucasian people give their opinions or tell the truth, or what they perceive to be the truth, others accuse them of racism. These accusations did not stop Lou Dobbs. Lou also spoke out - very early - before anyone else was talking about it - against the outsourcing of American jobs. Against the tax cheating and greed of some multinational corporations. He also spoke out against corporate greed within our American borders - long before the current economic crisis. Lou also exposed the corruption of some politicians in Washington. Exposed the danger of the "beltway" attitude. Whether you like or dislike Lou, or agree or disagree with him, the biggest tragedy, and the purpose of this post, is that CNN has caved in to special interest groups. I'm sure that CNN management tried to get Lou to "go with the flow," and the "official" version is that Lou left to explore other opportunities. But as Sarah Palin said - only dead fish go with the flow. How sad that CNN, one of the largest cable media networks in the world, has decided to silence a voice that provided debate and conflicting views. God forbid that the American people should hear a viewpoint other than the liberal media talking points. Debate and conflicting views are part of what makes America great. The voice of Lou Dobbs and others will not be silenced though. See you on the radio Lou! Salams dear sis. I just <3 your writing. This was an excellent post. Thank you for bring your viewpoints to a public forum. Well written and respectable. How do you get your passport back after hajj? How do you prove your indentity without it???? My husband says that people give it to the Hajj leaders/tour managers. They coordinate with the government. I would feel lost without the passport, any reason WHY they take it away from you? You are right - ANY country DOES have the right to police its borders and control the immigration. And some places, like UAE, has the law that they won't allow you entry if your passport has an Israeli stamp! Hmm. Lou Dobbs. I don't think he's racist. I think he's an isolationist and so dreadfully boring. I could not turn on his show without seeing some piece about closing the borders or China taking jobs from Americans. Like a blond Pat Buchanan. Eww. After a while, people stop listenig, no matter how valid one's arguments. W/ Dobbs, less would have been much more. What I am trying to say is that American media needs ALL voices. We have plenty of liberal/conservative voices. Plenty of Democrat/Republican voices. But FEW voices from those who identify themselves as Independent. It was the Independents who, in part, made a difference in the election of Obama. I even occasionally listen to Michael Savage. I want to know what all people are saying and thinking. But if some media outlets don't permit all voices, then the media is biased. The outsourcing of American jobs and "illegal" immigration are huge issues that out elected issues have swept under the rug. Everyone else has sovereign borders. Why is America not allowed to have sovereign borders? Didn't realize it was you until I clicked on your profile ... too early in the morning, and my MS brain is still a bit frozen, hee hee.